The Paraglow was produced this 2007 season by breeding a male Paradigm X DH Sharp Sunglow female. 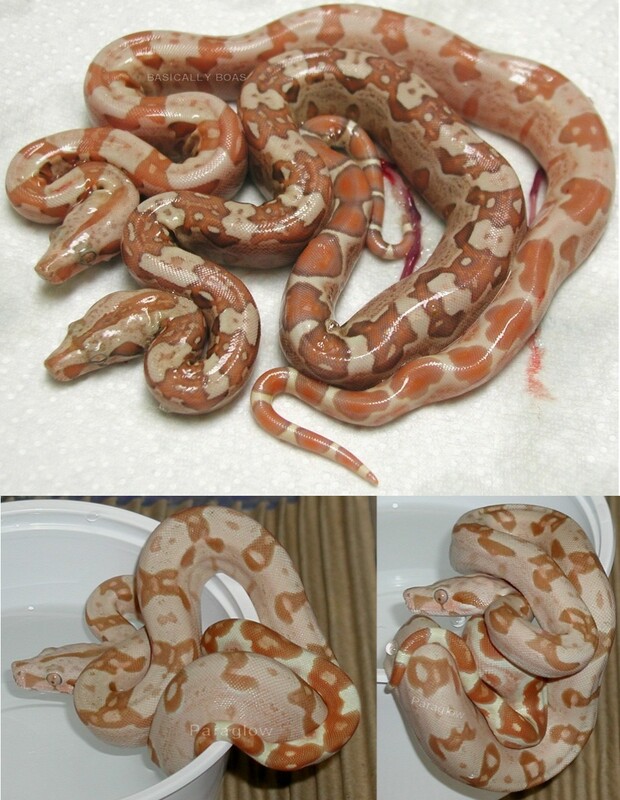 The results were great with us getting Paraglows, Paradigms, Albinos, Salmon Hypos, and Normals all in one litter! Make NO mistake, the Paraglow IS a T+ Sunglow as it is a Hypo form of T+ Albino. Some may disagree, but I would say they have other interests involved in forming their opinion. After having the Paradigm X Ghost litter also this season, we now know that the Salmon Hypos & Normals from both of the above mentioned litters are either 100% Het Sharp or 100% Het Caramel. They can not be both or they would be a visual Paradigm! When a Paradigm is bred to a wild type or normal appearing Boa, the offspring will either get one or the other gene from the Paradigm, ie: Sharp Albino or Caramel Hypo. We can not wait to make some great Designer crosses with our New Paraglow Boa! There will be a few nice ones, we are sure, but what we are really shooting for is a Motley Paraglow! (T+ Sunglow Motley). We hope to have at least the Paradigm Motley and Sharp Albino Motley on the ground by the summer of 2009! This is going to be a fun and exciting project for us. You have to also remember there are still tons of crosses that can also be made with the Caramel Hypo genes! Remember, the Paradigm is not your average T+ Albino. It is capable of making Sharp Albinos, Caramel Hypos and more Paradigms when bred to just each other! We came up with the name by using dictionary.com and it's thesaurus reference page. The second definition of Paradigm is: an example serving as a model; pattern. To us the Paradigm served as the ideal Boa with how great the genetics were even with out it being completely figured out. Those to me fit well as it tells you the Paradigm is a cut above the rest! So there is the history of the naming of them. Oh ya, Paraglow....well 'glow' being the Hypo form of most mutations made it only fitting to call the Hypo Paradigm the Paraglow. Thanks for reading and have fun with your Boas!!!!! !